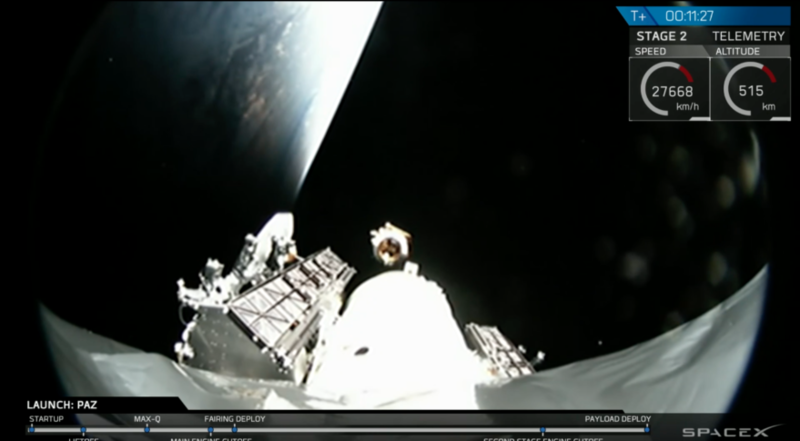 Hisdesat's Paz satellite seen separating from the Falcon 9 rocket's upper stage. SpaceX's demo broadband satellites Tintin A and B are visible on the left and right. Credit: SpaceX video still. SINGAPORE — Boeing is not actively building any satellites for the constellation it proposed to U.S. regulators two years ago, an industry executive said June 25. “We have a filing but we haven’t really started developing it yet, so I would call that not really moving forward,” Dawn Harms, vice president of global sales and marketing at Boeing Satellite Systems International, said at the CASBAA Satellite Industry Forum here. Boeing has applied to the U.S. Federal Communications Commission for a constellation numbering between 1,396 and 2,956 satellites in low Earth orbit for global internet access. Since that application, which has yet to be approved, the company has revealed little about progress with the constellation. Boeing has emphasized partnerships on the constellation, leading to speculation that the company’s main goal is to do the regulatory heavy lifting to increase customer interest in buying a large constellation. Harms did not answer an audience question about whether Boeing would sell the constellation rather than operate it. “We are open to doing what makes sense in the future,” she said. SpaceX, meanwhile, is further refining its constellation after launching two prototype satellites in February. Per FCC rules, SpaceX has six years from the date of authorization (March 29) to launch a minimum of half of its constellation and nine years to launch the full number. SpaceX anticipates starting service with around 800 satellites in 2020 or 2021. “We’re looking to continue the program,” Hofeller said.